I got an email from CJ, Commission Junction, saying they're introducing a new Pay Per Call "Ring Revenue" affiliate program system where you can making money as an affiliate by getting people who are interested in a certain service or product to call an advertiser for more information -- and I'm sure as they want, to hopefully make an easy sale to the advertiser. 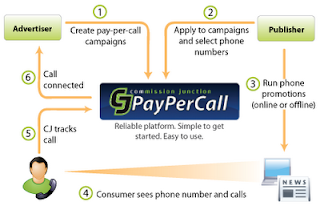 It intrigued me because I'd never heard of Pay Per Call before -- Pay Per Action, yes, Pay Per Post, ad naseum -- but never Pay Per Call. So I signed up (do the same if you're already a CJ.com affiliate by clicking the pic above) and hopefully I'll get approved and make a lot of sales. Right now, my CJ.com account could seriously use some beefing up since I haven't sold an Apple Store products in a while, and have only made dollars here and there pitching SnagAJob.com . Now that's something new!How could we possible to make our visitor to call when they don't even click (on ads)? I had no idea that CJ also offered this service, thanks. Another network that also uses the technology is Tradedoubler if anyone was interested. I also heard that Tradedoubler was doing this which is better for me as I can find CJ unreliable.